Greece Slouches Toward Default As Germany Rules Out Further Debt Talks : The Two-Way Germany says that there will be no more negotiations after the Greek premier called for a nationwide referendum on a bailout plan. Meanwhile, fearful Greeks are withdrawing their euros. People stand in a line to use the ATMs of a bank in the northern Greek city of Thessaloniki on Saturday after the country's prime minister announced a snap referendum on an international bailout — pushing Athens toward a Tuesday deadline for a plan to prevent default on its IMF debt. 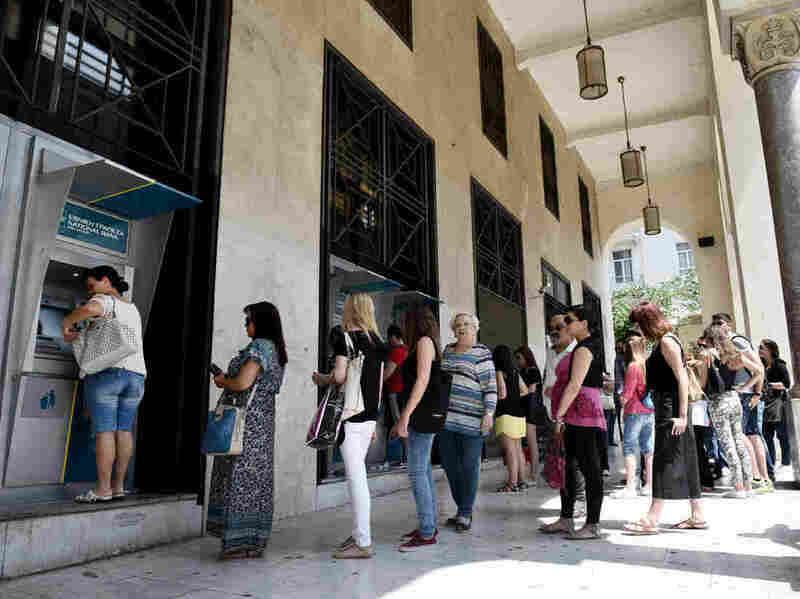 Across Greece, people lined up outside banks and at ATMs to withdraw euros today after their prime minister called for a surprise referendum on a proposed international bailout for the troubled country — a move that has pushed Athens to the brink of default and an exit from the eurozone. With no solid agreement, the Greek government is set to default on 1.6 billion euros ($1.8 billion) owed to the International Monetary Fund on Tuesday. As Reuters notes: "Its stricken banks have depended on emergency liquidity from the European Central Bank to stay open, and the banking system faces at the very least a further flood of withdrawals after billions have left in recent weeks." The news agency reported that a third of Greek ATMs ran out of cash to dispense on Saturday. "We have no basis for further negotiations," German Finance Minister Wolfgang Schaeuble said Saturday, following the announcement of the referendum on nationwide television by Greek Prime Minister Alexis Tsipras. "Clearly we can never rule out surprises with Greece, so there can always be hope. But none of my colleagues with whom I've already spoken see any possibilities for what we can now do," he said, adding that "there are no more negotiations." Germany, home to the European Central Bank and the eurozone's strongest economy, has led the negotiations, insisting that Athens slash its bloated social welfare net and crackdown on tax cheats. The Eurogroup issued a statement saying that Athens broke off negotiations "unilaterally." The ministers said they had taken note of the call for a referendum, but noted it would come too late, as the current arrangement would expire on June 30. Joanna Kakissis, reporting for NPR from Athens, says that the decision to call a popular referendum came as a surprise. Tsipras, who leads a leftist, anti-austerity party, called for the vote after an emergency cabinet meeting. "We are facing a historic responsibility to not let the struggles and sacrifices of the Greek people be in vain, and to strengthen democracy and our national sovereignty — and this responsibility weighs upon us," he said, adding that the proposed bailout is recessionary and would force the country to remain "a debt colony" — forever unable to pay off billions in loans to international lenders. He set the referendum date for July 5. But as Joanna reports on Weekend Edition Saturday: "The prime minister didn't seem to want to take responsibility of rejecting the lenders' offer and sending Greece into default, so he asked the Greeks to speak." As The Associated Press notes: "The call for a vote has strained relations to a near breaking point between Greece and its creditors, some of which say there may be little left to do to save Greece after five months of fruitless and frustrating talks. The sides are haggling over the reforms the country needs to make in exchange for more financial aid but have managed to only increase uncertainty over the country's future." A default and exit from the eurozone would cause the country to revert to its previous currency, the drachma, almost certainly entailing years of instability, extremely high inflation and poverty. "And, of course, there will be isolation from Europe, and I think that's what Greeks fear most," Joanna says. It's not the first time that a Greek premier has proposed a high-stakes referendum seeking political cover for an unpopular bailout. In 2011, Prime Minister George Papandreou called for a similar vote but quickly backed off, yielding to international pressure.